It’s Wedding Wednesday, and I’m going to cheat just a little bit because we get our proofs back tonight and I’m so excited about adding beautiful photos to Wedding Wednesdays that I’d hate to post something today and have the perfect picture to go along with it tomorrow. So instead, I’ll tell you a little story about the day before the day before. There aren’t any pictures to accompany it – though I should have taken a self-portrait because my outfit was rockin’ it! I’ve been at the same job for about 2.5 years and a few times this year I found myself pulling out my hair and thinking “If only I wasn’t planning a wedding I could be spending time job searching – but alas earwax that will just have to be put off until after W-day.” A couple of months ago my wonderful brother found himself unemployed and spending his days searching websites for possible opportunities and he came across one that he forwarded to me. It closed July 25. I think he sent it to me around July 20. So, I applied and then I waited. And the more I waited the more I wanted it. The more I wanted it the more I visualized myself there. And let’s be honest the hypothetical math (*that’s the math you do with the salary range when you really have no idea how much tax etc will be taken off) was pretty awesome. I couldn’t take it anymore. In mid-August I called and asked if they had timelines or if they had already called successful candidates and I was not one of them. September 8th, was the day before the day before and the last thing I thought I would like to be doing that day is interviewing for a new job. But given The Boy’s threat to call the whole thing off – I agreed. So I spent the day before the day before in a beautiful purple skirt, polka dot top, blue blazer and heels interviewing for a new job. Have you heard about wedding-brain? Well it’s not a myth and try to get through an interview with wedding-brain which is basically a brain that has turned to mush due to too many lists…. it’s not great. My report post-interview was mediocre. I never think they go particularly well but this one was really formal and extremely difficult to read how well I had done. Plus, you never know who else they’re interviewing so how am I supposed to know how it went?! Bah! Turns out – it went pretty well. I am now wrapping up my last two weeks at my current job and I start my new one exactly 1 month after being married. The benefit of having an interview the day before the day before (if there is one) is once it was over – it was over. I moved on to the 30 lists running through my brain. And I spent the next two days being completely present, loving The Boy and his orange tie. How did you spend the day before the day before? 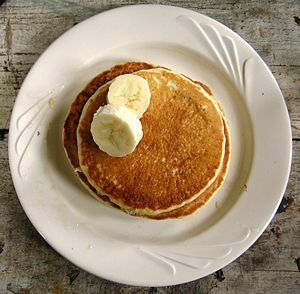 Image via Wikipedia - sadly I forgot to take a picture of our pancakes. But for the record we topped them with peaches! In keeping to our commitment of cooking dinner, The Boy and my biggest hurdle seems to be indecision. This is why I need to meal plan and shop accordingly – next week’s goal! Last week, Mama Pea came to the rescue. Breakfast for dinner. The Boy and I enjoyed her delicious Apple Cinnamon Pancakes for dinner last night. I’ll admit, we were both nervous – as I think anyone is when you veer away from your favourite pancake recipe – what if these aren’t as good? And I was positive I had over mixed. The Boy, his concerns were with the size of the pancakes. To be fair our regular pancakes are quite thin and light, and these were thick and denser. But man on man they were worth the risk! Apple Cinnamon Pancakes. Maybe not the healthiest dinner – but delicious none the less. And they were from The Book – bringing me one reciPEA closer to cooking my way through the entire thing. To kick off Wedding Wednesdays I thought I’d kick things off with a list. After 10 months of planning it all came down to 1 day, and while for all intents and purposes that day was PERFECT (I was married by the end of it after all and that’s really all that matters) here are 10 things that could have gone a little more perfectly had I thought of them beforehand. Turns out I have a nervous stomach. I planned to drink a whole veggie juice for breakfast and have sandwiches for lunch, but alas – it’s hard to drink out of a glass bottle while your head is being pulled in a million directions and by the time lunch came… forget about it. I should have brought a straw for my juice and had a snack in the car from the church to the reception that wouldn’t get in my teeth or spill anywhere… maybe cheese and crackers would have worked. A few of these tips will have to do with the dress. To be honest I could probably do 10 things I learned about my dress on my wedding day. But for starters I should have had the dressmakers take a picture of the back of my dress as it was on my at my final try on. That way I could give that picture to the people putting me in the dress. As I look at the pictures of me from the wedding day I can see why I was having issues with the dress… it wasn’t on right. It should have been lower in the back to pull up the front. It’s fine, I still looked great and no one would have been able to notice but me, but when it came to crunch time I found I couldn’t explain how it was supposed to be in the back with adrenaline and nervous energy running through my veins while trying to get it on. Have an order for who needs to be ready when. We just kind of went with the flow. While it made for a very relaxed morning/early afternoon when the photographer got there I didn’t have make-up on nor did my sister. We should have been earlier in line. Again, not a big deal all the pictures were taken and we were relatively on time but it could have gone smoother if I had thought of that while I still had my brain. Again with the dress, have the seamstress put an extra set of loops in the corset even if they don’t do up during the fittings. I lost significant weight in the last 48 hours before my wedding. Stress – the greatest and worst diet there is. An extra set of just in case loops would have been helpful to keep the dress and all it ‘s glory in perfect place. Hire a day-of coordinator. My mom was awesome. She was more than awesome actually she was super fantastic. I do not think we needed a wedding coordinator, we had a perfect day without one, but I think my mom might have relaxed a little more if we had someone else in charge the day of. Someone that’s not so emotionally attached and wants to talk to people but can’t because they’re trying to coordinate too many things. A day of coordinator would have made sure we had an order for who got make-up when. Would have checked the dress. And would have handled all the clean up. My mom did a fantastic job – I just wish she didn’t have to do it. Print out lists for boys and attach them to their foreheads. Boys are silly. They got where they needed to be and again everything went fine but their sense of time is a little off – especially when they are all quite hung over. Write notes for your speech. I did write some things down, but I didn’t print them. We did very well given our lack of practice or notes but we did forget a pretty major thank you – Thank you to everyone who traveled to be here – and there were a lot of people who traveled. I thanked everyone individually, but I forgot the formal thank you. Oops. Probably should have written that down. There will always be downers. There will be people who have grumpy faces or say inappropriate things to you or your new spouse or your wedding party. F ’em. It’s your day. You look beautiful. You are married. That’s all that matters. Start with the side of the room that might not last all night long. The Boy and I tried to say hi to everyone. We tried to do it all, eat dinner and circulate the tables. We did a pretty good job if I do say so myself, but we started on the wrong side of the room. We started with Table 1, which was right beside the DJ, and all of our friends tables which were also on that side because they’re young and won’t care that they’re sitting beside speakers. We didn’t even think of it. We should have started with the other side of the room. The friends of our parents, aunts, uncles, second cousins – the ones that may not stay on the dance floor until we kick them out at 1am. We missed a lot of people because we started on the wrong side of the room. Shoot. Introduce your vendors to your wedding party – or maybe just tell them to leave you alone. All of our vendors were really great with one tiny exception… they kept talking to us! I wish I had thought to say “Nice to meet you. Please direct all of your questions to any of the beautiful ladies in the gray dresses or any of the handsome gentlemen in the orange ties. Not the tallest one, but any of the rest of them. 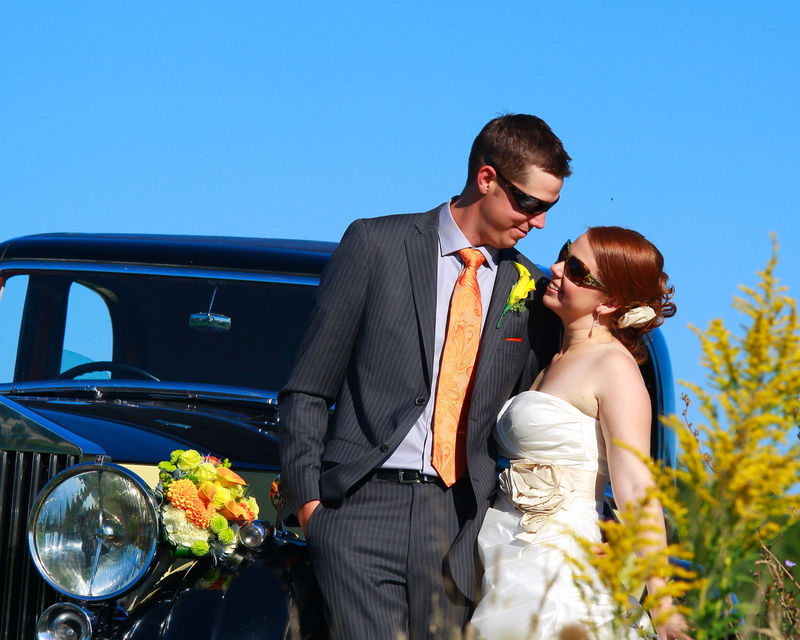 Thank you.” Instead we fielded their questions, and while I truly appreciate them checking with us if they were unsure of anything – they could have checked in with any member of our wedding party – that’s what they’re there for. That’s it! Seriously, if these are the worst things from the day (the vendors were too helpful? – this is not an actual problem! ), it truly was a perfect day. These were simply a few things that could have been even more perfect had I thought of them ahead of time. And since I know that I have a few future bride followers… I just thought I’d share. PC Load Letter – WTF does that mean? My office is right by the photocopier. Life is interesting when you work by the photocopier. Do you know how many people take their life’s frustrations out on the photocopier? Everyone. All day long I listen to slamming photocopier drawers, sighing when it doesn’t work, and “who took my printing?” But recently, as in the last week – the photocopier bangs everytime it prints. It still prints fine(ish). It just sounds like it’s the original photocopier from the beginning of time and it seems to be adding extra stress to the apparently already very stressful process of photocopying. This is why I keep my door closed and headphones in as much as possible. It’s not because I’m anti-social (well, maybe a litte) it’s because listening to an office of 12 people yell and sigh and slam the photocopier is quite possibly the most annoying sound in the world. Too bad they probably wouldn’t get it. New Name, New Year, New Habits? I’ve long had a theory that the real new year is Labour Day weekend. September is back to school and even if you’re not in school, just getting back into regular routine seems to happen this time of year and that means (at least for me) kicking off some new resolutions/trying to get into better habits. This year it will be different! Now it seems that I’ve got myself an anniversary right around the same time so I’m hoping that each year The Boy and I will take some time to set up new goals for the year, talk about how things are going and what we’d like to do differently – marriages work like that right? HA! Spoken like a true newlywed. Nonetheless, I can dream and in the process set some new goals for myself for this fall – let’s not get crazy and expect them to last all year! Last week was “honeymoon” week. We did not go on a honeymoon. The reasons were plenty, mostly because we figured if we booked something then The Boy would get a teaching contract and we’d have to cancel – so we didn’t, and he didn’t. A close second was the number of vacation days I have a year, and still really wanting to be able to go to Florida in November. And third, I really couldn’t imagine planning an AWESOME honeymoon, while planning the MOST AWESOME wedding. So I didn’t. We plan to go away in either March somewhere hot, or next summer somewhere far. Time will tell. Despite not having left the country for the week following w-day we did honeymoon in the sense that we did not cook for ourselves and we slept… a lot. The Boy and I were exhausted all week – so we ordered a lot of take out and were passed out cold by 10:00 most nights. This ends today. Resolution #1: Gym. I haven’t been in about a month, Charlotte probably doesn’t even remember me and I’m pretty sure I’m going to have to start again. But I’m eager to go back – stress may have shed some serious pounds the last couple of weeks but I need to get my bum back in gear to keep them at bay. Resolution #2: Read. I can’t tell you the last time I went to bed early and read a significant number of pages. All I know is it was a LONG time ago. There is a stack of books by my bedside and a million more racing through my head wanting to be read. Hello old friend the book, it’s me Meaghan. I know it’s been a while but I was wondering if I could schedule some time in with you. First up, the remainder of Eating Animals – I’m pretty sure it’s going to change my life now that I have the brain power to actually pay attention to what it says. Resolution #3: Eat. This fall is going to be an adventure in blending. That’s right – I we got my our very own Blendtec as a w-gift and I’ve got some plans for it. The Boy is out being sporty at least two nights a week as it is right now. And that means I see Mmmm Sauce, and Cheezy Hummus (I need to find get this recipe from the Sista), and soups, and more in my our future. Glorious! 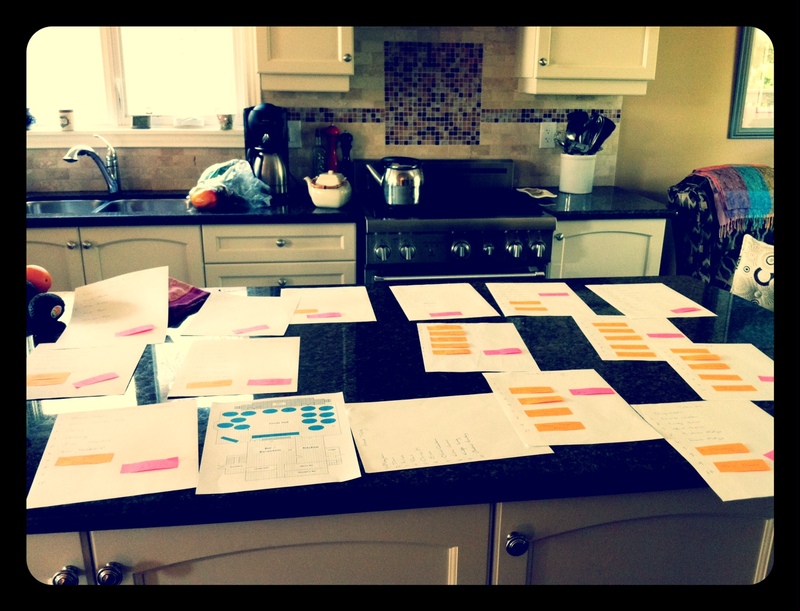 Meal planning and grocery lists and real food galore. Takeout ends tonight, as do meals of cookies, shrimp cocktail and popsicles circa last night’s dinner of champions! Resolution #4: Knit. A post is coming to update you on what I’ve been knitting for the last 10 months. I’ll give you a hint, every member of our wedding party got a hand knit item. 10 months is technically LOTS of time for 10 items, and it was… sort of. But it was also less relaxing and more a job to do. 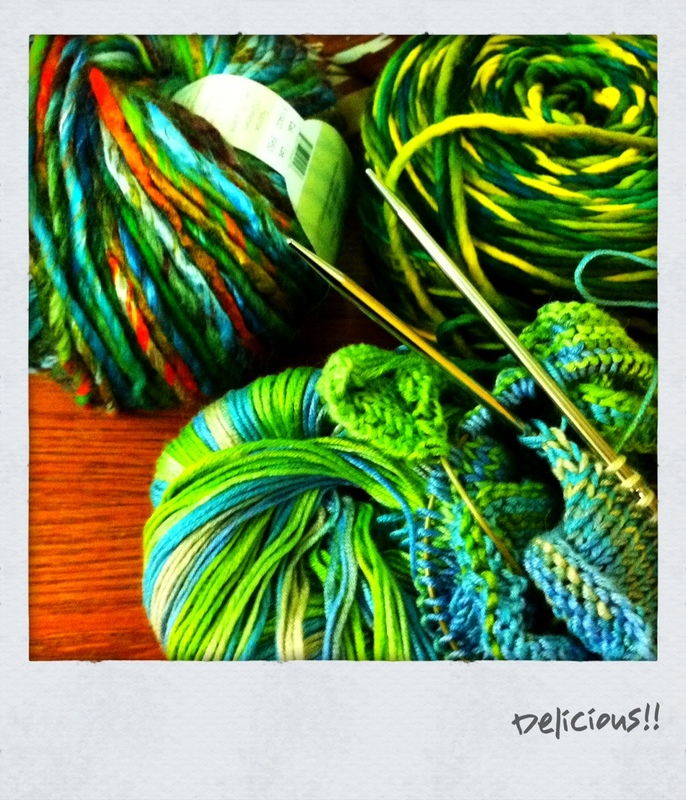 Since w-day I’ve been to two yarn stores, and made purchases both times. I’ve knit 3 tiny toques for some pending new arrivals, and I’ll remind you we’ve only been married a week. The timing couldn’t be more perfect, as the weather changes my love of knit wear grows and I can’t resist churning out items for the pure joy of it. I’m allowing myself 1 month of glorious stress free knitting before I let the Christmas crunch set in. You may recall from my post from the night before that I was feeling a little unsure about what would be different once The Boy and I said “All the days of my life.” I decided we would officially become the F word. A family. To be honest I wasn’t exactly sure of the words as I was typing them. I mean, he’s been my family for a long time. Would I really feel any different? I’m here to tell you friends the answer for me, and for The Boy is an emphatic, absolute, no doubt about it, bolded, underlined and italic YES! We agreed, it’s more than a piece of paper. It’s definitely something worth celebrating. I’m someone’s wife. The Boy, he is my husband. The past few days we keep saying it to each other as if trying it on for size. Our day was perfect. Honestly, aside from a toe cramp on my end and a green finger on The Boy’s end (we’re visiting our jeweler on Sunday!) absolutely everything went off without an issue. Our venue was beautiful, our venders were awesome, our w-party was everything we needed them to be. 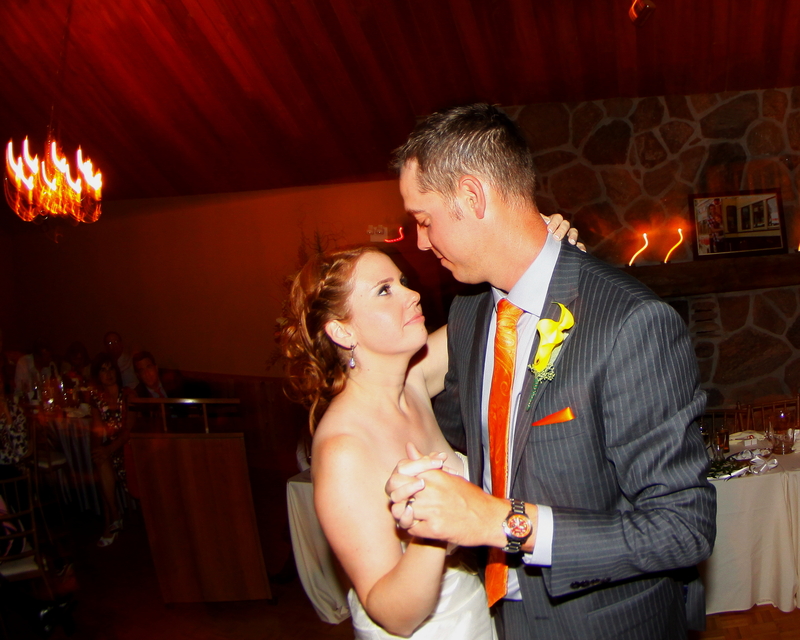 We danced all night long, it really was a perfect day and a perfect wedding. All of the work, and 10 months of planning, the stress the week or two before, all of it – totally worth it. I am someone’s wife. The Boy, he is my husband. It feels different. It’s a feeling in my heart and in my gut. It matters. The piece of paper matters. It’s different. I’m different. We’re different. It’s more than a piece of paper. This is one of two sneak peek pictures I have from our second photographer, Brian Van der Pryt, if you have photography needs in the Windsor area – let me know I’ll hook you up! I’m so excited to see them all I can hardly stand it! A full recap to come, but I think so as not to overwhelm I’ll stick with my plan and tell our story through Wedding Wednesdays. That should at least give me a few weeks to get more pictures from people! This is it. Still technically the day before – though we are certainly less than 24 hours. A new family member. Although he’s been a member of my family for a long time. Oh right. A new family. We will be our own family. We’ve been a team for a long time. Whenever the Boy is stressing out about something I say “Hey! Team W/M. We’re a team we can do it!” Tomorrow, we upgrade. Tomorrow we become the F-word. We become a family. I’ve We’ve been planning this for a lifetime 10 months, and what did I think today… if I just had one more day I would feel calmer. I don’t need one more day. It will come together. It will be perfect. Or it won’t be. Either way at the end of the day a new family will have been born. We didn’t practice dancing. We haven’t really written a speech… though we’ve talked about it. But that’s okay, we’ll be a family – not losing the ones we’ve come from but starting our own in addition to those. Mostly, I keep thinking how funny it is that tomorrow is one of those BIG days – the most important of days… and I am spending the night without the one I love the most. Beyond being super excited to marry the Boy, and see him tomorrow of course, I really can’t wait for that time tomorrow when we travel from the church to the reception by ourselves, to check in with him. How was your day? Was it a good day? I think that’s a good sign – right? My mom’s cousin’s are in from Detroit, they brought my favourite Great Aunt Doreen to join in the w-day festivities. We had Harvey’s Bristol Cream tonight as a sleep well drink… one of them was going downstairs to throw it out onto the grass as an offering to Mother Mary which would guarantee good weather and non-frizzy hair. I love them. And I love their love of Mother Mary. But most of all I love that my greatest concern for tomorrow is good weather and tamed hair. 22C and sunny. I think that’s a good sign. PS. Alyssa I haven’t forgotten you but I figured I had to tell the Boy before I told the world – it’s only fair. We ended up with 139 but alas… still 14 tables + a head table. W-guests are you reading this? We mixed you up! Come prepared to make new friends. We tried to get it down to 13 guest tables… but as much as we tried it could not be done. I think it’s going to be good.